The Fancy Food Show is a specialty food trade show that is held twice a year; San Francisco in the winter and New York in the summer, at the Javits Center. This year it’s June 28, 29 and 30. It is huge, I believe the biggest of its kind. All kinds of: merchants, producers, megacompanies and small ones like Gustiamo; real, fake and funky foods, all 250,000 of them, according to the organizers. You will walk with the other 24,000 people (also, according to the organizers) and you can feel lost and dizzy, if you don’t know where you are going. So, remember 2949 and go there. It’s our booth, right outside the so called Italian pavilion, which is the immense space purchased every year by the Italian Trade Commision. Despite these hard economic times, we decided to repeate last year’s experience (on the left our booth in 2008 – it will be the same, in 2009 – can’t spend a cent more). We decided to go, again not so much because we hope to create new business (which we would love, but it does not happen, there), not to see what is happening out there in the market (nothing is happening out there – it’s always the same stuff) but to meet you, our friends and have a good time. The booth is expensive, but we try to keep other expenses to a minimum. No carpet, no decoration and no particular lighting. The shelves and tables come from the office and we bring all the products ourselves (the charges from common carriers are outragious). But we’ll have tastings and a friendly chef will prepare dishes with our foods. 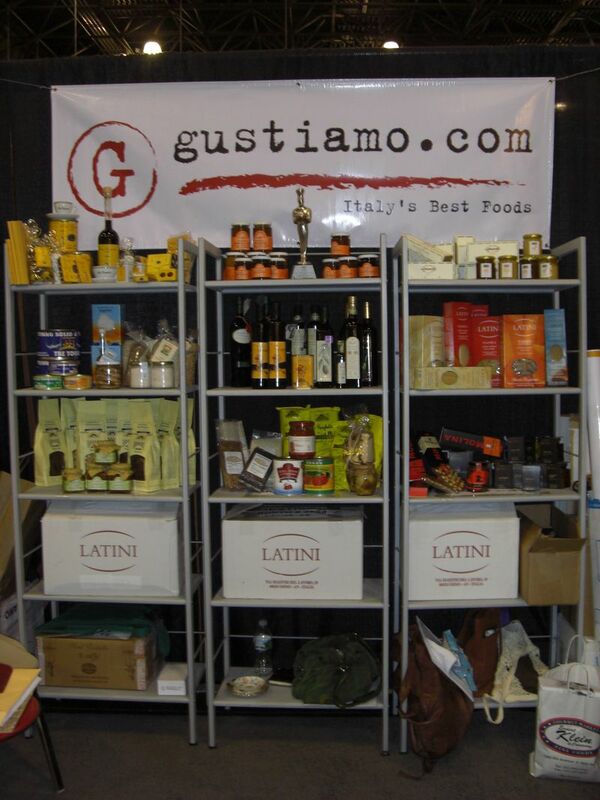 If you want to see a preview of some of the products we’ll bring in, read this page, which is the official Gustiamo exhibitor page. So, see you at 2949.